Post-Punk Cinema Club: Why should I love: Raj Kapoor? 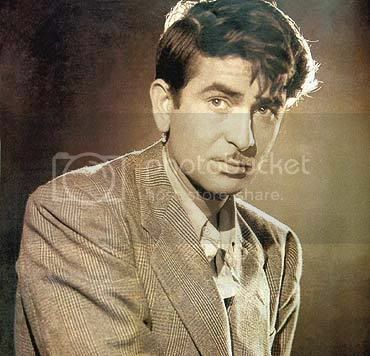 Why should I love: Raj Kapoor? 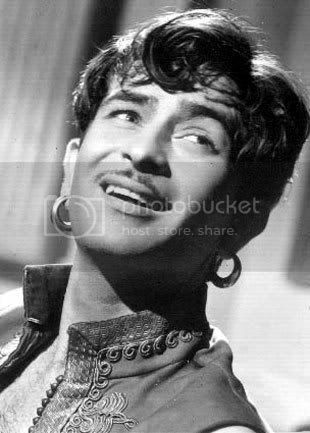 The brief window of Raj Kapoor's ultimate gorgeousness, before he succumbed to the Kapoor familial blobbiness. 1. Insensitive gender relations and a tendency to objectify his heroines when directing. 2. His style of acting could sometimes spill over into over-the-top self-obsessed indulgence. Alas, we can't really argue with these - they are, unfortunately, two of his very real weaknesses as an artist. Yet, we still remain very big admirers of Raj Kapoor, mostly because his talents - when they were on full-force - far outweighed his faults. The thing about Raj was that he was inspiring! For the PPCC, when Raj was on his game, he was the absolute best - no other Indian actor can even compare. He was transcendental. He was open and human and incredibly alive. More than once, we found ourselves not only completely compelled by his performance, but also completely blown away by his talents behind the camera. As a director, he delivered stark visual aesthetics that favored dramatic geometry - sharp diagonals, powerful contrasts of light and dark, moodiness and intensity. As an actor, he could project complexity, vulnerability and loads of charisma and he was especially effective when restrained. We reckon he did his best work in black and white, as his efforts in color (notably, his post-Nargis efforts) - Satyam Shivam Sundaram and Mera Naam Joker - paled (pardon the pun!) in comparison. Help us, reader log, what film is this from? He didn't have great jodi power with his male costars - we recall seeing a Dilip Kumar/Raj Kapoor film where both leads seemed ill at ease, and Sangam's Raj Kumar/Raj Kapoor pair was likewise flat - but his pairing with female costars was far more succesful, the most famous being his relationship (both on- and off-screen) with Nargis. 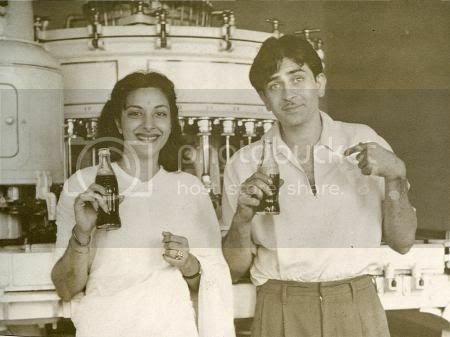 A very cute behind-the-scenes photo of Nargis and Raj. Yay, Google images! Many actors since his era have tried to emulate him, in particular our current house favorite, Anil Kapoor. Apparently when Anil Kapoor saw Awaara, he was blown away (much like the PPCC!) and decided to be an actor (we just decided to watch more Raj Kapoor movies). Funny then that we should have called Anil's performance in Yuvvraaj a "Raj Kapoor in Awaara type of performance" - and indeed, the more we watch of Anil, the more we see how he's inherited quite a bit from the Raj Kapoor legacy (e.g. Virasat, Eeshwar). Apparently there was some idea floated around last year of making a Raj Kapoor biopic with Anil Kapoor in the lead. Despite no physical resemblance (what will we do about Raj's huge, expressive, emo eyebrows? ), we think this is a fantastic idea. (Ooh, and OMG, who would play Nargis?!) DO IT, PEOPLE IN CHARGE. DOOOOO ITTTTTTT. 1. The unique, transcendental power! 2. The gorgeous, painful subtlety! 3. The shades of Shakespearean wistful sarcasm! 4. His ability to combine radical dystopian aesthetics with "patriotic schmaltz"! 5. And, well, the PPCC likes to watch him cry, too. I did not really like Raj Kapoor's "I am innocent" image very much, but his films were good. Awara, I liked Mera Naam Joker (but maybe more because of the Russian girl), Shree 420 and many of his black and white films. Colour was not that much fun. But he was one of the best ever. I am so glad I'm not alone in the Raj pyaar. I think he's amazing and I was surprised at how many online fans detest him, although now I can certainly understand why. hey no mention of his lovely post-blobby roles? i love mera naam joker, one day i'll do a phd on that movie because its so symbolic of raj's life! I like Raj Kapoor - Awara was the first Indian film I have seen. As for who would play Nargis? Rani Mukherjee would be my choice. TCP - I'm also not a huge fan of the bhola mode, I can tolerate it - as in Teesri Kasam or Anari even. Thanks for the gentle comment! Ajnabi - No, you always have meeee! I will stand by Raj, even after I finally get around to seeing Mera Naam Joker, because his Awaara was so good it forgives all future sins too. eliza bennet - Wow, Awaara as the intro! And Rani as Nargis?! OMG YOU ARE A GENIUS! Raj Kapoor woes one of the Best Showman in Bollywood. I am also a big fan of him and I do love him too. I even open a Forum about him. the other photo of RK where he is wearing those funny kundal earrings is from a drama-song sequence in a movie called 'DASTAN'.